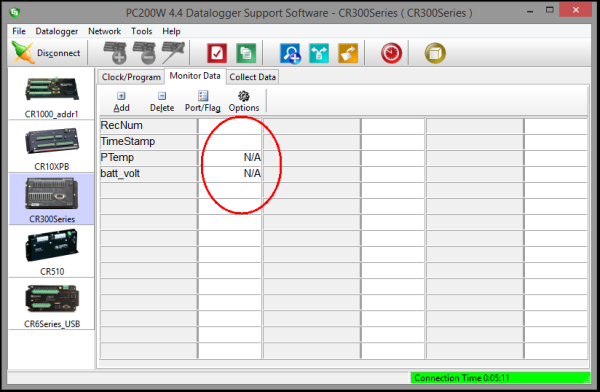 If you use Campbell Scientific data logger support software to connect to your data logger, you may monitor your data from within the software. Have there been times when you’ve seen “Undefined” or “N/A” instead of your data values? What does that mean, and how do you fix it? In this brief article, we’ll look at what to do—whether you’re using LoggerNet, PC400, or PC200W software. In the LoggerNet Connect screen, click Num Display (Numeric Display) from the menu bar and select Display 1, Display 2, or Display 3. If you see "Undefined" listed instead of your values, it means that those variables are not available for display. Undefined values are often caused by a changed or different program running from the one that was running when the Numeric Display was set up. Press the Delete All button to remove all data values from the display. Highlight the cells, and press the Delete button to remove the undefined data values from the display. Press the Add button to bring up the list of data tables that can be viewed. Select a table or field, drag it from the list, and drop it into a cell. 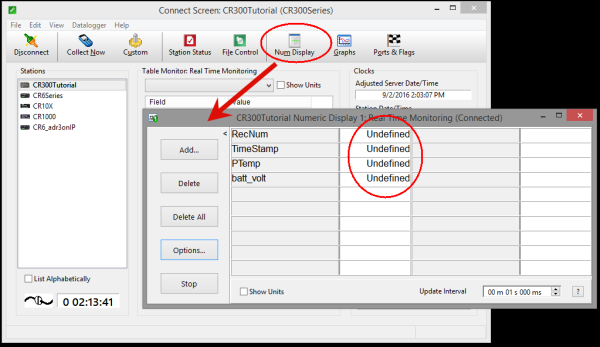 If you use the PC400 or PC200W Monitor Data tab, you may see "N/A" listed instead of your values. This means that those variables are not available for display. Frequently, this is caused by a changed or different program running from the one that was running when the Monitor Data tab was set up. Press the Delete button to remove the undefined data values. Whether you use LoggerNet, PC400, or PC200W with your Campbell Scientific data logger, I hope this article helps you replace any “Undefined” or “N/A” values with your real-time values. Recommended for You: To learn more about the Table Monitor, read the "Tips and Tricks: More Than a Monitor" newsletter article and watch the "LoggerNet Software | Changing Variables" video.